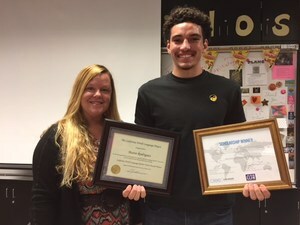 Albany High student, Mateo Rodriguez, was honored at the April 27 "Fiesta Fabulosa" at Albany High, where he received two framed certificates for being named a 2018 CIEE CLTA (Council for International Education and Exchange and California Language Teachers Association) "Student of the Year." Mateo also received a $2500 award, which he will use to study Spanish Languages and Cultures this summer as a CIEE Global Navigator in Palma de Mallorca, Spain. Congratulations Mateo!